Best Service has announced the release of Gladiator 2 Complete. 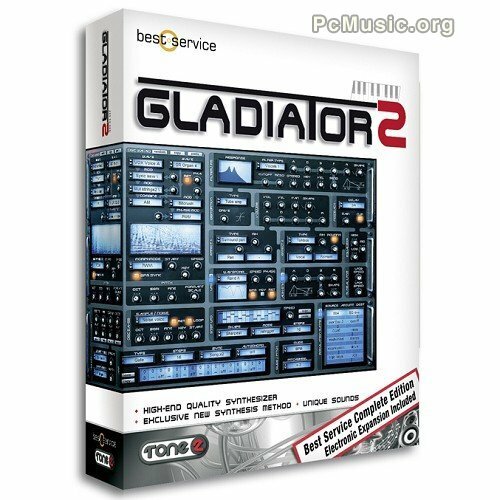 Gladiator 2 Complete is a boxed-version of Tone2's Gladiator 2 synth which includes the Electronic Expansion. For the record, Gladiator 2 is a virtual synthesizer based on the concept of Advanced Harmonic Content Morphing (HCM) Synthesis. It supports an extensive list of synthesis types : Harmonic Content Morphing (HCM3), Frequency Modulation (FM), Amplitude Modulation (AM), Phase Distortion (PD), Pulse Width Modulation (PWM), Phase Modulation (PM), oscillator sync, wave shaping, supersaw, resynthesis sounds, vocoding, additive and sample playback modes.